Assuming that these cylinders have two solenoids (one for â€˜inâ€™, one for â€˜outâ€™), and two proximity switches (one forâ€¦ah well, you get the picture), I want to create an add-on instruction that has the common logic in it, so I can just execute that instruction for each cylinder. After all, whatever the cylinders size or function is in the machine, every cylinder basically has the same properties and commands. 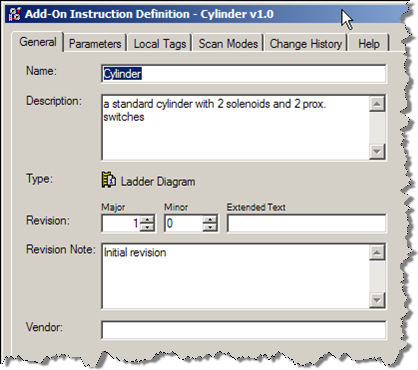 Right click on the Add-On Instructions folder in the controller organizer, and click â€˜New Add-On Instructionâ€™. If you go to the â€˜Parametersâ€™ tab, you can define the parameters your instruction will use to do its magic. As you can see in the screenshot below, Iâ€™ve defined my parameters. Donâ€™t panic if you donâ€™t know exactly which parameters youâ€™re going to need for your add-on, you can still change everything later. The EnableIn and EnableOut are two parameters that every instruction has, and are automatically created for you. 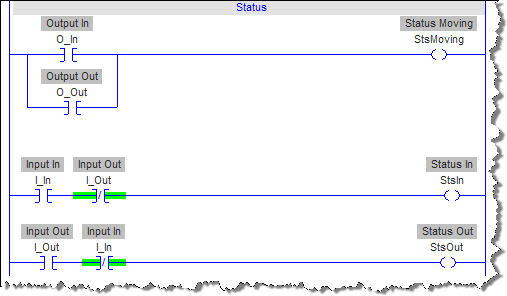 I added command bits, status bits, a fault bit, a maximum travel time, a clear fault bit, and the I/O my cylinder is going to have. Letâ€™s not worry about the other tabs at this point, we have enough to create our instruction. 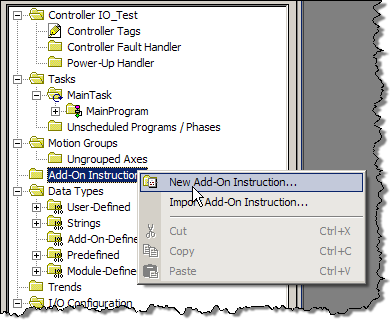 Itâ€™s time to use our add-on instruction! (If you hover your mouse over the button where it says â€˜Cylinderâ€™, you will get a preview of what the instruction is going to look like). In this example, Iâ€™ve added inputs from an input card (Local:1) for the commands (pushbuttons or something like that), and of course for the I/O from the cylinder. The rest are just tags I created, and for â€˜Timeâ€™ I entered a value of 3000 (milliseconds). Pay attention to the tag at the very top, called â€˜Cyl1â€™. 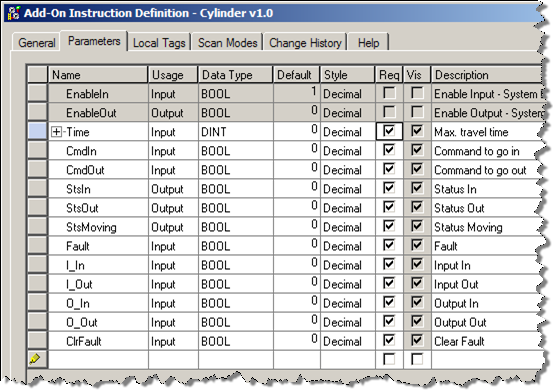 This is a tag of the type â€˜Cylinderâ€™. The data type was created automagically when we created the instruction, but you need to define one tag of that type for every instance, so the program can store data in there. (For you Siemens addicts, itâ€™s like an Instance DB). Now that we have all our parameters wired up, we need to do something with them. Our add-on instruction needs some logic! 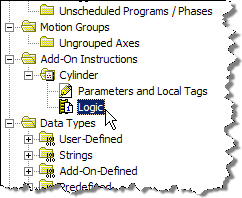 In the controller organizer, find your add-on instruction, and then open up the editor by double clicking on â€˜Logicâ€™. The next part of this article is of course just my interpretation of what a cylinder should do; you can of course use your own interpretation to create whatever functionality you want here. 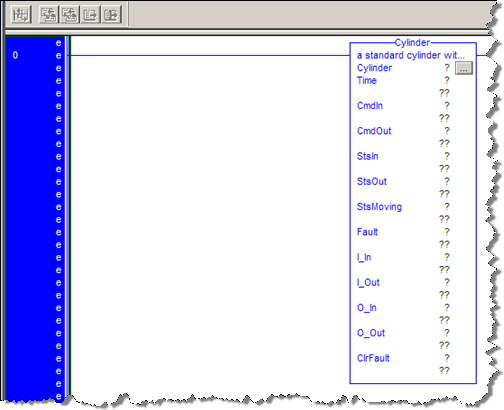 Here you see that if there is a command to go in (which we hooked up to the CmdIn parameter) then I turn on the output to move the cylinder in (O_In) and keep it energized, unless there is a fault, or the cylinder is in (StsIn). The same goes for moving out of course, in the second rung. 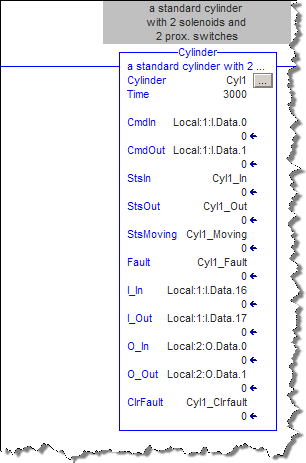 If either one of the outputs is on, the cylinder is moving (StsMoving), and when the input for cylinder in or cylinder out is true (and the other one is NOT, which is a security I usually build in), the StsIn or StsOut parameters are set to true. First I set the preset value of the timer to the value that was passed to my instruction in the â€˜Timeâ€™ parameter. In the next rung, I let the StsMoving bit start that timer. Once the timer is done, it will keep itself energized until somebody resets the fault with the ClrFault parameter. 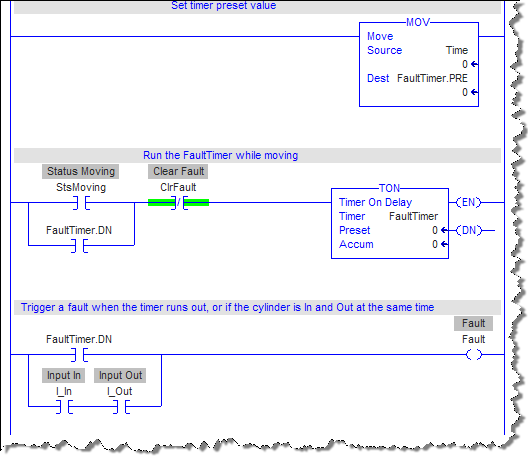 Also, the fact that the timer is done (FaultTimer.DN), or the fact that the cylinder is in and out at the same time, triggers the â€˜Faultâ€™ bit that is used in the first couple of rungs to turn the commands off. Thatâ€™s all the logic I wanted to show you. Use our imagination, and you can see a whole lot of fancy alarm and diagnostic bits, and maybe even a position sensor. A great benefit of this is, that once youâ€™ve made a solid piece of code, you can re-use that add-on instruction in other projects as well, by exporting and importing the instruction, and even build a library of instructions for common parts of your applications. The sky is the limit here. You can think about pieces of equipment, like valves or motors, or even pieces of functionality, like for example recipe management, or complex calculations. And of course, as we all know, during the project, the required functionality will change. 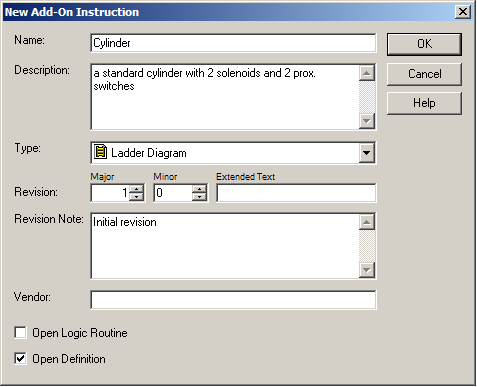 If you used add-on instructions, youâ€™ll only have to change the logic once, to change the behavior of every piece of equipment that uses the instruction. Submitted by aklabifo on Thu, 2009-11-19 08:30. Submitted by Tim Young on Fri, 2009-11-20 13:58. Submitted by Don (not verified) on Sat, 2010-01-16 20:37. Submitted by AYMAN KAMAL (not verified) on Sat, 2010-02-06 22:14. Submitted by Anonymous (not verified) on Fri, 2010-02-05 00:04.
how to get free download of this software??? Submitted by moayad (not verified) on Sat, 2010-02-06 08:24. Submitted by Jeff (not verified) on Sun, 2010-03-14 11:04. Submitted by Fabio Malaspina (not verified) on Tue, 2010-03-23 22:46. Submitted by Warren (not verified) on Mon, 2011-05-30 08:12. Why won't the rslogix 5000 demo let me connect to a plc? Submitted by Tim Young on Mon, 2011-05-30 12:40. You'll have to pay for that privilege. Submitted by Anonymous (not verified) on Wed, 2011-11-16 08:55. Submitted by Charlie Zha on Sun, 2011-12-11 18:31. 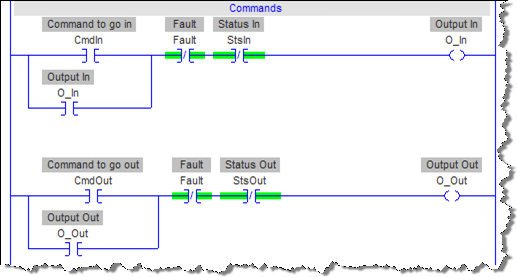 Since the new upgrade of controllogic firmware, the structure of the Add on instruction has been changed from V17. However, it doesn't support the CitectSCADA. We test severl times, the communciation can be build for 2-3 mins, then it will drop. So downgrading of the controller is recommanded if you would like to use controllogic PLC and CitectSCADA at the same time. Submitted by Coowallsky (not verified) on Fri, 2011-12-16 11:13. An unconditional MOV of the 'Time' input parameter into the timer preset is a recipe for major fault. Submitted by Anonymous (not verified) on Fri, 2012-04-27 10:41.
why is it a recipe for a fault?